While the Europeans were fighting wars in ways that would not have astonished Archimedes or Julius Caesar, a brief, sudden flash of science many miles to the east managed to save the last vestige of the Roman Empire—for a while, anyway. It happened in Byzantium, the state created by Emperor Constantine when he converted to Christianity in 324 c.e. and moved the eastern half of the Roman Empire to the Greek colony of Byzantium, in Turkey. The Byzantine Empire’s capital, Constantinople, became a great trading hub, but it faced danger from a host of covetous enemies, especially assorted Muslim satrapies. Byzantium had a solid corps of scientists, most of them Greek, into which it tapped for some sort of military technology that would make it invulnerable. The Greeks succeeded beyond anyone’s wildest hopes, for they were responsible for that age’s thermonuclear weapon, “Greek fire.”  In fact, Greek fire wasn’t entirely new. In about 400 b.c.e., scientists in ancient Greece, called upon to devise a new weapon that would break the will of besieged fortresses, came up with what they called a “fire weapon.” A product of early Greek advances in chemistry, it combined pitch, sulphur, granulated frankincense, and pine sawdust in a mixture that was packed into cloth sacks. Set alight, the sacks would be launched by catapults into the interior of fortresses, where they spread flames in all directions on contact. To the distress of defenders, pouring water on the flames seemed only to spread them farther. In 673 c.e. the Byzantines were desperate for a weapon that would protect Constantinople, a port city, from attack by sea. The Byzantine navy was weak, so there was a critical need for some kind of weapon that would destroy invasion fleets and deter any landward attack. The Greek scientists decided that a fire weapon would be especially effective against wooden ships, but a careful look at the “fire weapon” of a thousand years before instantly revealed its limitations. Catapults were not that accurate, so the prospect of a machine with sufficient accuracy to launch a sack—a not very aerodynamic missile, in any event—from hundreds of yards away and hit a moving ship was remote at best. Launching such weapons from a ship was a possibility, but there again, the problem of accuracy arose: How to hit a target from a ship rolling in ocean waves? At this point the Greek scientists recalled that in their travels around the Middle East, they had seen a strange, smelly black substance oozing out of the ground. Nobody knew quite what to do with the substance (the Greeks called it “petroleum”), but the scientists noted that the black goo was highly flammable, whereupon they made the conceptual connection: convert “Greek fire” into a liquid weapon. In short order they devised an amazing weapon that anticipated the flamethrowers and napalm bombs of many centuries later—a mixture of petroleum and calcium phosphate (made from lime, bones, and urine) that amounted to a more powerful, liquefied version of the ancient “Greek fire.” Then they designed a weapons delivery system for it, an apparatus consisting of a large storage tank containing the petroleum mixture, a hand-turned pump, a hose made of animal hide, and a nozzle with a spark-driven “trigger.” The next step was modifying small galleys to carry the new weapon; the tank and the pump were put below decks, while the hose and the nozzle were fitted above decks, on the bow. The weapon came just in time, because the Saracens launched an invasion fleet toward Constantinople, intending to take the city. The fleet was met by several small, fast Byzantine galleys at sea. Using the superior maneuverability of their smaller ships, the Byzantines swung close to the Saracen ships as a crew below decks pumped furiously and a man wielding the nozzle, protected by archers, aimed it at a target. When the liquid reached the nozzle, he struck two pieces of flint together, producing a spark that converted the liquid into a spurt of liquid fire that arched out as far as 50 yards. One Saracen ship, then another, was engulfed in flames; the rest fled in terror. The Ottoman Turks never did discover the secret of Greek fire, but no one else did, either. In the end, however, it hardly mattered. The Byzantine Empire, convinced it was invulnerable because it possessed an ultimate weapon that would never be defeated, grew complacent. It never tapped again into science to keep its military edge. It was only a question of time before relentless Arab pressure against a complacent Byzantine state began to tell—especially after the Byzantines, believing that their Greek fire would allow them to ignore any foreign threats, focused inward on their political and religious schisms and grew progressively weaker. Not even the wonder weapon of Greek fire could paper over such cracks, and by 971 c.e., Byzantium’s time of glory was over. It would finally collapse under renewed assault by a resurgent Islam; Constantinople eventually fell and was renamed Istanbul. Greek fire used since at least the seventh century in the eastern Mediterranean. Its precise composition is still obscure but devices capable of projecting a flame some distance existed and were used at least until the twelfth century. Anna Comnena described the Byzantine ships armed in this way; ‘ the Greek fire to be hurled at the enemy through tubes was made to issue from the mouths of these figureheads (gilded lions) in such a way that they appeared to be belching out fire’. She then goes on to discuss the action against the Pisans during the First Crusade when these weapons were used. Their main advantage, apart from the terror caused, seems to have been the way in which the spout of fire could be precisely aimed, ‘often downwards and sideways, to port or to starboard’. 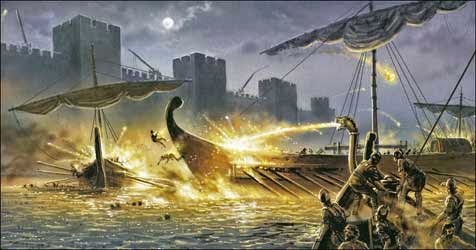 In 717–8 the second siege of Constantinople by the forces of the Caliph was arguably largely determined by the judicious use of ships armed with Greek fire siphons against the attacking fleet which was attempting to cut the city off from its hinterland. W.L. Rodgers, Naval Warfare under Oars: 4th to 16th Centuries: A Study of Strategy, Tactics and Ship Design, Annapolis, Naval Institute Press, 1967, pp. 37–9.